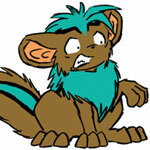 Ogrin *looking at a large palm tree, climbs halfway up, but then slips and slides down and hits the ground*: Ow! I almost got it that time! Ogrin *continues facing the tree, puts hands on his hips, and looks over his shoulder at me*: What do you think? Ogrin: No duh. What do you want anyway? Me *pulls out a pen and a notebook*: An interview. Me: I want to give someone an interview because I’m a reporter for the Neopian Times. Ogrin: Yes, I noticed that, *nods slightly at my notebook where it is labeled ‘Basabre’s Neopian Times notebook’* but why interview me? Ogrin *turns fully around and sits down next to me*: Sure I will let you give me an interview, but you seriously couldn’t find another Ogrin? Ogrin: Not really… You just have to look a little. Me: I’m not good at looking for stuff… And since this has barely anything to do with the interview, let’s just start. Question One: In the description of Ogrins, it says you like to study stuff like nature and you are shy socially. Is this true? Ogrin *smirks*: Who likes studying, and you were shyer than me a few minutes ago. 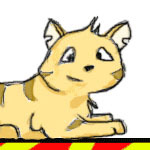 In your pet description, it says you are incredibly loyal and like to spend your time prowling around Neopia. Is any of that true? Me *decides not to write anything down*: Question Two: Before your species was discovered, did you know any Xweetoks? Ogrin: Yep, and they didn’t tell anyone, did they? Me *thinking back to when I interviewed a Xweetok*: I interviewed a Xweetok a while back and he wouldn’t tell me the names of any undiscovered pets… So no, he didn’t tell me, and I don’t think the Xweetoks are what made you come out of hiding. Why do you all keep each other secret? Ogrin *thinks for a minute*: See, recently discovered pets keep undiscovered pets secret unless the undiscovered pets want to be discovered. There are hundreds of undiscovered pets out there, and most of them don’t want to be known yet. There are sometimes a few undiscovered pets that want to be discovered that are from species that don’t want to be discovered, so they come out of hiding but don’t tell other people about what species they are or where they came from. Mr. Chipper, who owns that little ice cream cart in Happy Valley, is an example of that. Me *tries to write, but has trouble because the Ogrin was talking very fast and was very confusing*: Uhh, right, let’s move on… Question Three: Is it true that your species evolved from the April Fools pet the Dattup? Ogrin: I’m not completely sure, but probably not. If you consider how long a time period there is from April first to now, it is only about eight or nine months. Evolution can take millions of years. Unless TNT made our evolution from Dattup to Ogrin speed up, I really doubt the Ogrin evolved from the Dattup. I do have to admit, however, we do look very similar, but that could just be coincidence. Me *writes*: Question Four: Can you tell me the names of any undiscovered pets? Ogrin: No. You should know this from my answer to your second question. Me *writes*: Sorry, you were talking a bit fast before. Ogrin: Let’s hurry things up; I just remembered I have a Faerie Quest to do. Me: Last Question, Question Five: How do you feel about not being a Limited Edition pet? Ogrin: I really don’t care whether I’m Limited Edition or not; as long as I’m alive and myself, that's really all that matters to me. Me *writes*: Huh, that’s different… I think I would like to be Limited Edition because then I would stand out a little bit more. Ogrin: We all have different opinions. Me: Yeah, you are right… I thought Ogrins were scary before I met you. Ogrin *looks at me strangely*: Right… Well, see you later. Bye. Me: Thanks for the interview, good bye. I think Ogrins are still a little scary… Well, once again, we all have our own opinions, but you should not judge a book by its cover like I did… Unless you know the book is evil, like it has a curse set in it by the Darkest Faerie or Sophie the Swamp Witch… Then you should probably put the book back down where you found it and run away fast.